17) What are the two parts of the United States Congress? The Senate and the House of Representatives. 18) How many United States Senators are there? 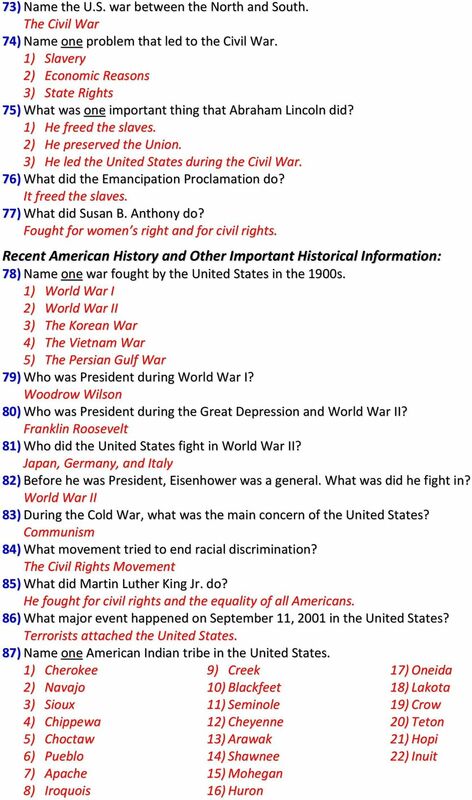 Download "17) What are the two parts of the United States Congress? The Senate and the House of Representatives. 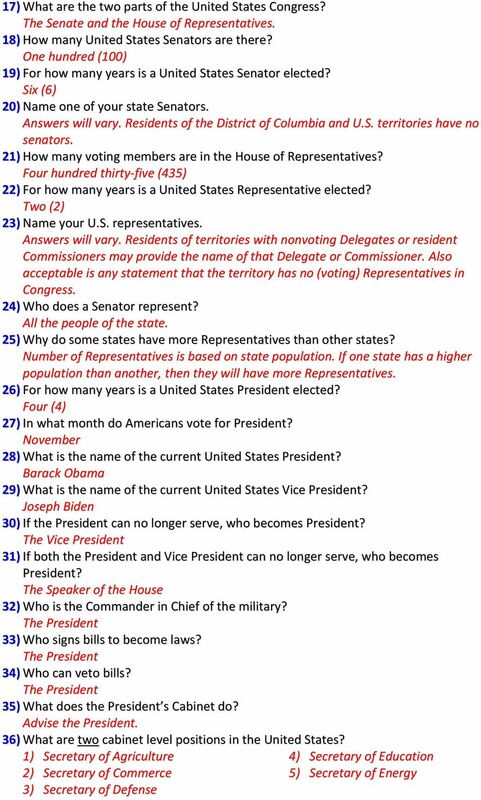 18) How many United States Senators are there?" 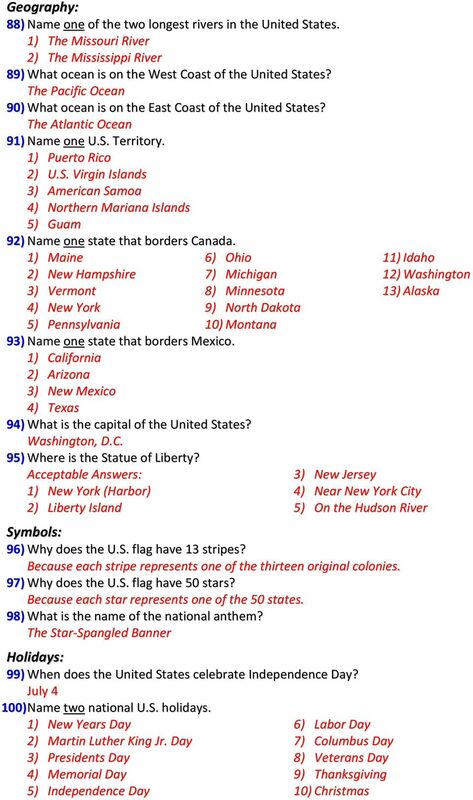 1 FreeCitizenshipTest.Org Name 100 Citizenship Questions The following is a list of the official 100 questions and answers used on the new U.S. citizenship test. Principles of American Democracy: 1) What is the supreme law of the land? The Constitution 2) What does the Constitution do? Sets up the government. Defines the government. Protects basic rights of Americans. 3) The idea of self-government is in the first three words of the constitution. What are these words? We the people 4) What is an amendment? A change to the Constitution. An addition to the Constitution. 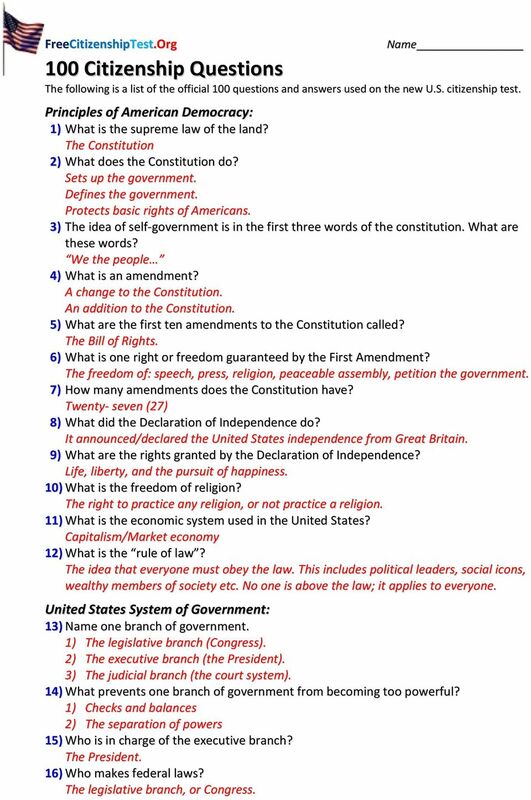 5) What are the first ten amendments to the Constitution called? The Bill of Rights. 6) What is one right or freedom guaranteed by the First Amendment? The freedom of: speech, press, religion, peaceable assembly, petition the government. 7) How many amendments does the Constitution have? 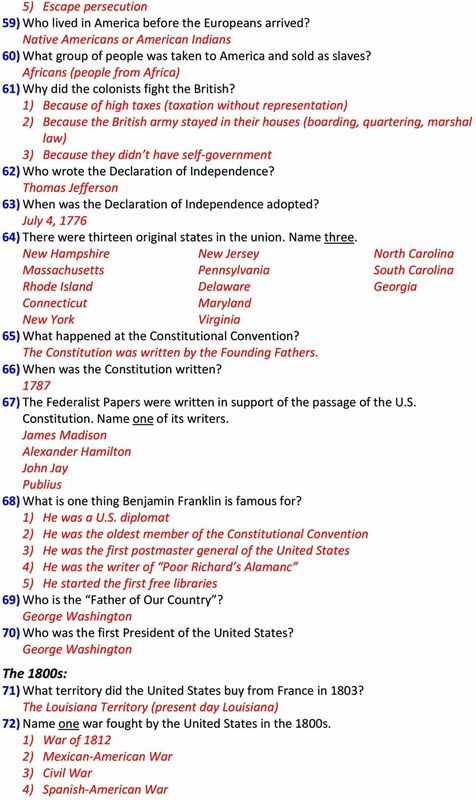 Twenty- seven (27) 8) What did the Declaration of Independence do? It announced/declared the United States independence from Great Britain. 9) What are the rights granted by the Declaration of Independence? Life, liberty, and the pursuit of happiness. 10) What is the freedom of religion? The right to practice any religion, or not practice a religion. 11) What is the economic system used in the United States? Capitalism/Market economy 12) What is the rule of law? The idea that everyone must obey the law. This includes political leaders, social icons, wealthy members of society etc. No one is above the law; it applies to everyone. United States System of Government: 13) Name one branch of government. 1) The legislative branch (Congress). 2) The executive branch (the President). 3) The judicial branch (the court system). 14) What prevents one branch of government from becoming too powerful? 1) Checks and balances 2) The separation of powers 15) Who is in charge of the executive branch? The President. 16) Who makes federal laws? The legislative branch, or Congress. 3 6) Secretary of Health and Human Resources 7) Secretary of Homeland Security 8) Secretary of Housing and Urban Development 9) Secretary of the Interior 10) Secretary of State 11) Secretary of Transportation 12) Secretary of Treasury 13) Secretary of Veteran s Affairs 14) Secretary of Labor 15) Attorney General 37) What does the judicial branch do? 1) Review laws. 2) Explain laws. 3) Resolve disputes (disagreements) 4) Decides if a law is unconstitutional (goes against the Constitution) 38) What is the highest court in the United States? The Supreme Court 39) How many justices are on the Supreme Court? Nine (9) 40) Who is the current Chief Justice of the Supreme Court? John Roberts (John G. Roberts, Jr.) 41) Under our Constitution, some powers belong to the federal government. What is one power that belongs to the federal government? 1) Power to print money. 2) Power to declare war. 3) Power to create and army. 4) Power to make treaties. 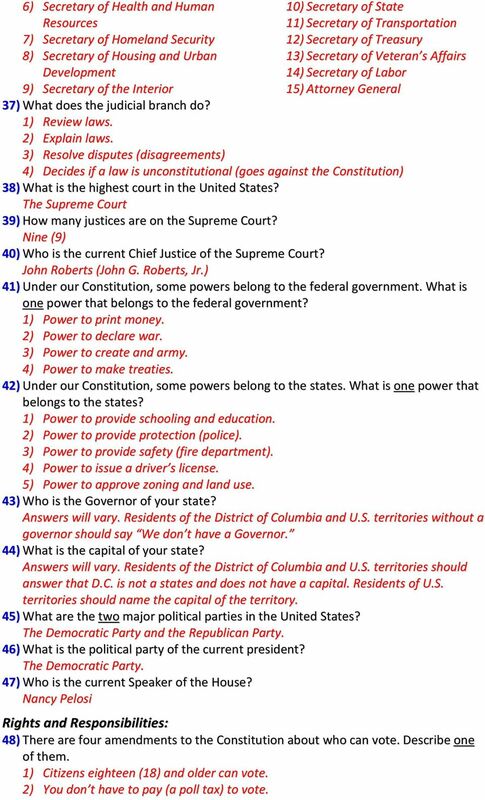 42) Under our Constitution, some powers belong to the states. What is one power that belongs to the states? 1) Power to provide schooling and education. 2) Power to provide protection (police). 3) Power to provide safety (fire department). 4) Power to issue a driver s license. 5) Power to approve zoning and land use. 43) Who is the Governor of your state? Answers will vary. Residents of the District of Columbia and U.S. territories without a governor should say We don t have a Governor. 44) What is the capital of your state? Answers will vary. Residents of the District of Columbia and U.S. territories should answer that D.C. is not a states and does not have a capital. Residents of U.S. territories should name the capital of the territory. 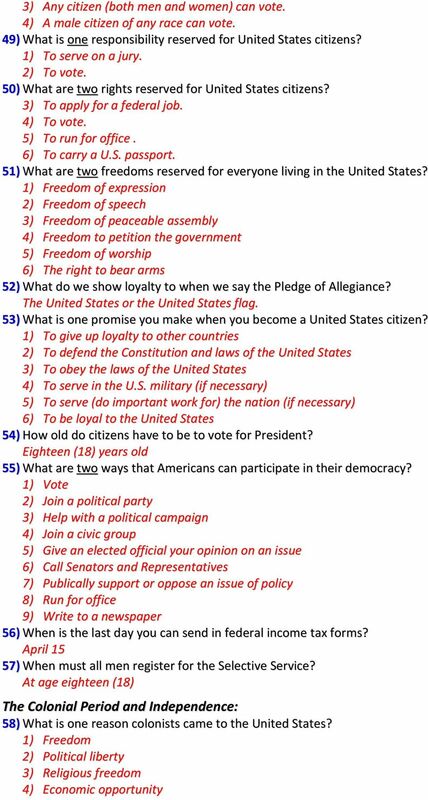 45) What are the two major political parties in the United States? The Democratic Party and the Republican Party. 46) What is the political party of the current president? The Democratic Party. 47) Who is the current Speaker of the House? Nancy Pelosi Rights and Responsibilities: 48) There are four amendments to the Constitution about who can vote. Describe one of them. 1) Citizens eighteen (18) and older can vote. 2) You don t have to pay (a poll tax) to vote. HIST-3 KES - Famous Americans Exam not valid for Paper Pencil Test Sessions [Exam ID:7N41Y0 1 What did this leader accomplish? A He helped free African American slaves. B He was an African American minister. First Grade Social Studies Unit 3: OUR COUNTRY Lesson 1: How do we honor our country?